Should You Consider Solar Powered Hydronic Floor Heating? Solar powered hydronic floor heating is the term used for water used for radiant heating powered by photovoltaics (solar collectors). Installed underneath floors, hydronic floor heating can make an enormous difference in the temperature of the flooring and consequently your home. While this green technology may work well, cost and practicality make this a difficult system to recommend to the average homeowner. In a solar powered hydronic floor heating system, solar panels are mounted on the roof to collect energy to heat water by the means of several pieces of equipment that also monitor the temperature and the amount of water being circulated. 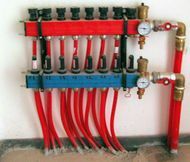 The water used in a hydronic floor heating system is contained in small sections of tubing that is placed underneath the finished floor, often cast into concrete. For this reason hydronic floor heating systems are installed during a remodel or when the house is being built (source). Hydronic floors can be a wonderful addition to a home, especially if your flooring is made of tile or hardwood. The radiant heat created also helps keep other heating costs at a minimum, so after installing hydronic floors you may see a significant reduction in your energy bills. Unfortunately, solar powered hydronic floor heating is an expensive option for heating your floor. Although the energy used when the system is in place is minimal, the cost to install such a system can easily reach $20,000 for a 2000 sq. ft. home. For this reason, people who install hydronic floor heating want to make a statement about green energy and support further photovoltaic research rather than try to save money through solar power. Solar powered hydronic floor heating systems are getting better everyday, but decades of research and refinement are required before this technology will be adopted by the majority of homeowners. However, those homeowners feeling energy crunch and who want to support solar energy can do so by purchasing a solar powered attic fan, which will save you money while supporting green research.